Does anyone have a link or photos of an early 3L tailgate with an OEM Lupo GTI spoiler or other OEM VAG / Votex spoiler installed? I realize all the previously mentioned options will needed to modified to fit properly. As I am sure you are aware, the Lupo GTI spoiler would need to be extended at the tips of each side to meet up with the edge of the extended (upper area) of the early 3L gate . I am just curious if the Lupo GTI spoiler will fit somewhat properly other than the previously mentioned needed mod. Any help with this detail would be appreciated. The 3rd brake light hole would also need be filled or blacked out due to the brake light being fitted in the interior of this tailgate. My goal is to keep an aluminum tailgate on the vehicle for weight savings / higher MPG reasons. I am also open to quality aftermarket options without the split or indention in the middle. Sorry in advance if I missed another post on this topic during my search this info. AFAIK the early 3L tailgates were made of magnesium. I've never seen one of those with a spoiler added on though. Seriously?! Wow, didn't think magnesium was pressable as it's so strong. The 3L must be a special car. Interesting read... knew a fair amount already, but bloomen heck it's about as complicated a car as the A8 or Phaeton... lots more to go wrong compared to the SDI. And all that to save just 150kg. 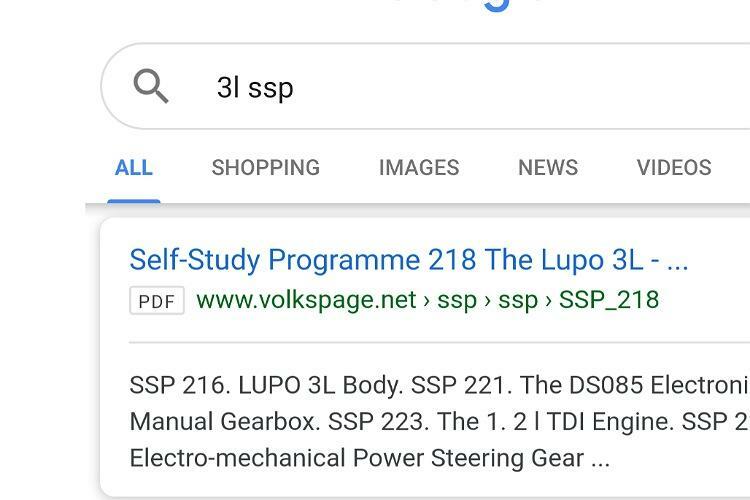 Might save money on the fuel bill, but hey, the repair bills will cost a lot more than the average lupo. So all in all, probably not worth it now it's becoming an old car. Unless you have all the tools. And a shed full of spares. Even the wheel bearings need special this and that... I wonder how much extra it cost compared to the SDI when new. Every 10 kg saved is the equivalent of adding 1 bhp - so it is like a 15 bhp improvement. Have to admit, the ghoulish part of me finds it reassuring that the 3L appears to be a more dealer only parts car than the Gti! I wonder how much extra it cost compared to the SDI when new. The early 3L tailgate had a magnesium frame with an aluminium skin. VW replaced it with a steel one because they wanted more weight over the rear wheels. That's why the battery was moved to the rear. Before this modification, the rear bumper had two lead weights. Even efterwards, the bumper still had one lead weight! VW's story is that they did this because the early tailgates were corroding. We have two of these tailgates and after twenty and eighteen years, neither is showing any sign of corrosion. And so is this. After a nuclear bomb, the only things left remaining on this earth will be termites, AK47's, Peavey amplifiers and Lupo SDI's. 3L is a very interesting car from a technical point of view. More capable than the SDi on the road thanks to the turbo and lower weight.